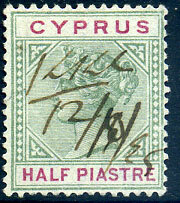 (T.21) on QV ½pi (SG.40) additionally manuscript dated "28/6-01.". 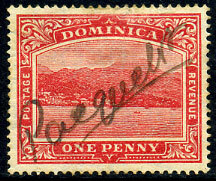 in red manuscript dated 19.7.1900 on QV ½d (SG.1). 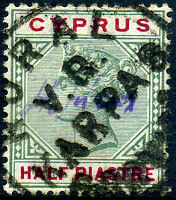 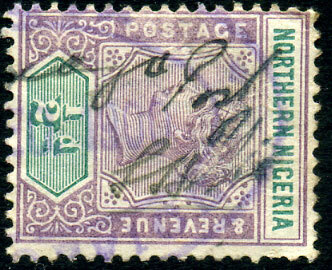 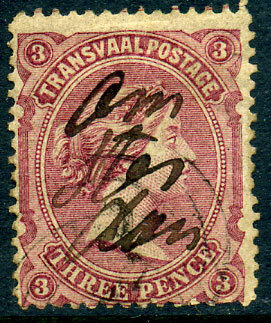 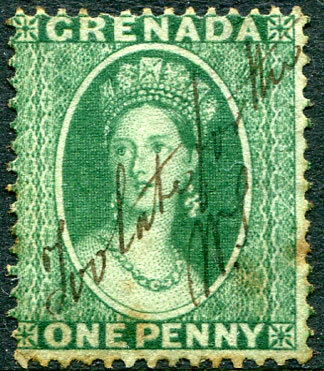 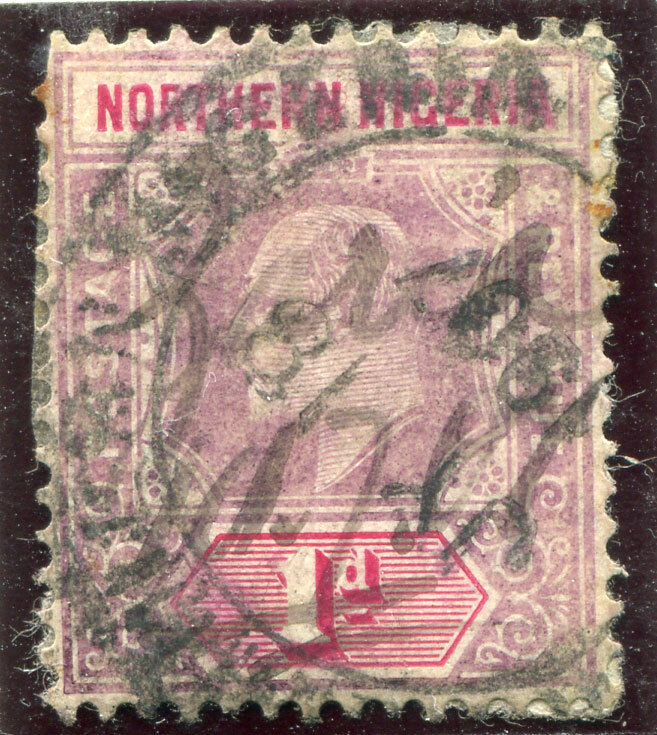 (T.21) with black ink "4/7/1901" on QV 1pi (SG.40). 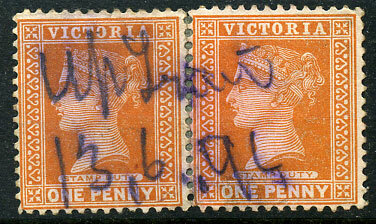 dated 12/11/99 on QV ½pi (SG.40) without additional datestamp/cancel. 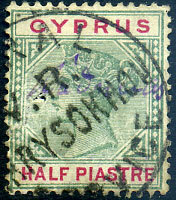 (T.21) dated "18-9-06" incorporated within handstamp on 1904 KE7 30pa (SG.63). 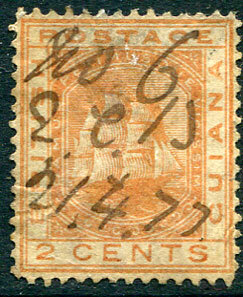 dated "23.7 902" incorporated within handstamp on vertical pair QV 1pi (SG.42). 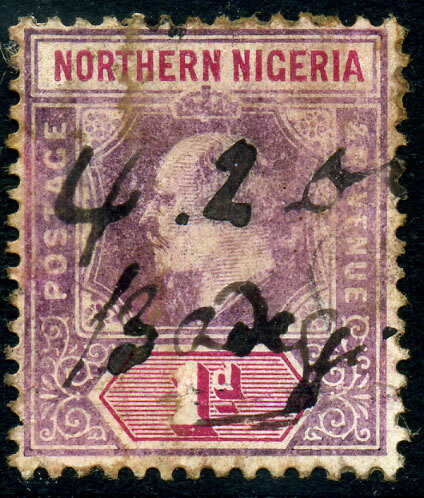 clear "4 2 0(9) Badeggi" in black manuscript on KE7 1d (SG.11), adhesive with surface rubbing and reverse toning. 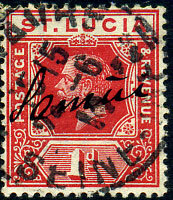 manuscript "Pacquebot" on 1d View (SG.28), minor toning. 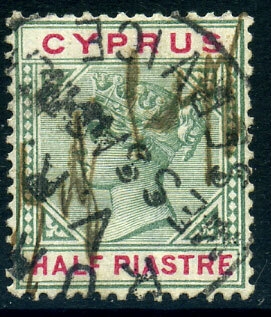 in m/script as "Marabast 30/1/88" on 1887 2d olive-bistre P.12½ (SG.178), defective lower left corner. 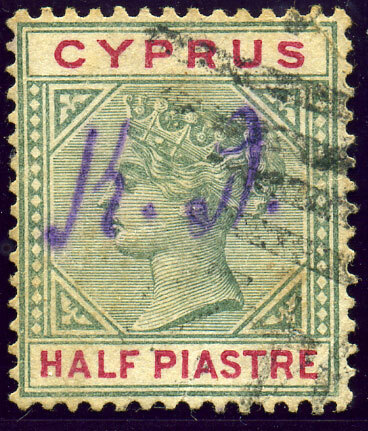 previously unrecorded manuscript on QV 1d (SG.47). 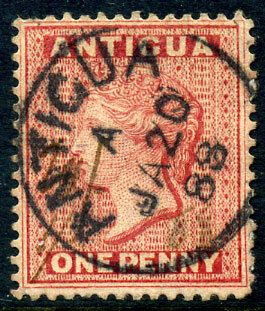 village manuscript date written in a spindly hand on QV 1d carmine-red CA wmk (SG.25) overstruck ANTIGUA A/JA 20 88 cds at St. Johns, short perf. 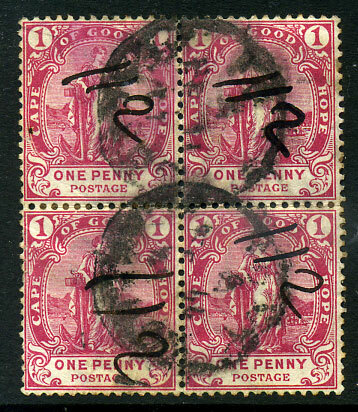 top left. 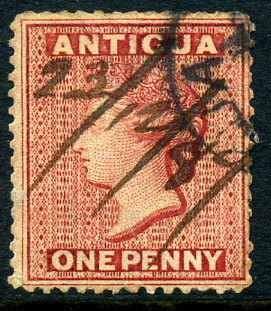 manuscript in black ink on 1878-80 QV 3d claret, indistinct d/ring cancel. 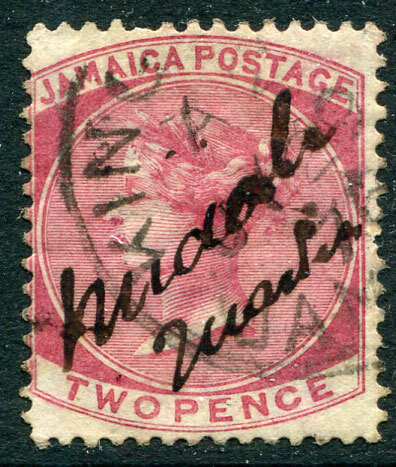 newly discovered previously unrecorded village manuscript (ERD and LRD) on KGV 1d strip of four, single, piece, applied by an office not yet having received its steel datestamp, left to be cancelled by Freetown reg. 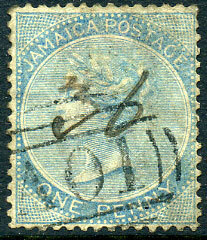 oval. 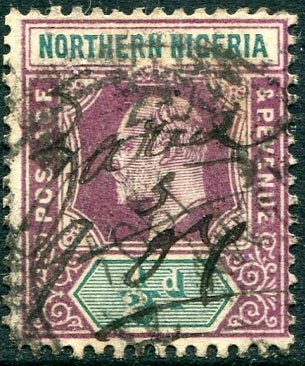 Rare and possibly unique. 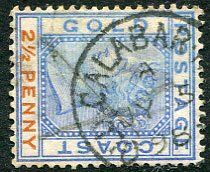 Offices opened on May 1st 1925 being Kangahun, Kumrabai Mamila, Levuma, Mabum, Magbenka, Mamunta, Yoyema. 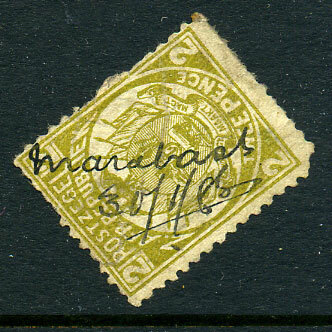 in manuscript on 6d CC wmk (SG.25a), perf. 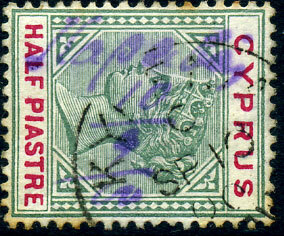 fault at left. 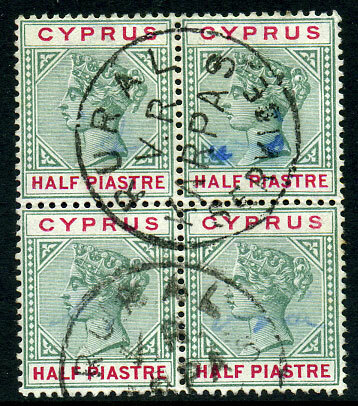 (T.21) on block of four QV ½pi (SG.40) showing manuscript markings. 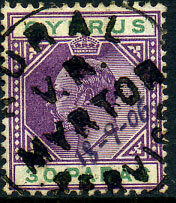 in purple manuscript on QV 2d. 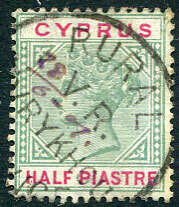 Ex PURVES. 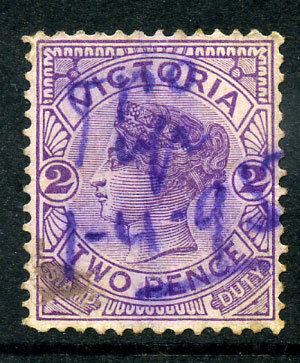 in purple manuscript on QV 2d. 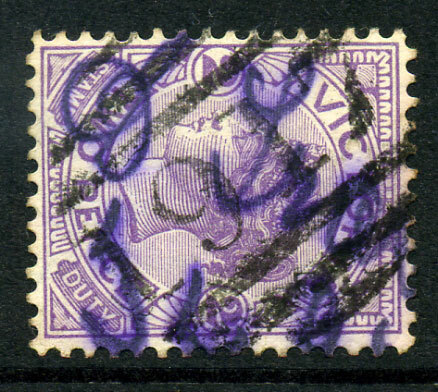 individually written in manuscript on block of four 1d (SG.59) with indistinct cds dated A/FE 11 01.
in purple dated "13.6.94" across re-joined pair QV 1d (see Purves Page 36).